These acrobats of the rose world are great for landscaping ideas where you want your roses to grow big and tall, across fences or walls, or up trellises and gazebos. 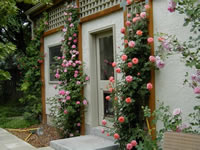 Roses that climb are a great way to take your garden vertical and give it an added depth that you might not have gotten otherwise. These plants are a fantastic way to add a focal point to your landscaping, and they can even be used to create borders along or within your property! Climbing roses are the tallest growers in the rose family, in many cases growing as high as 20 feet tall. This makes them extremely versatile in your garden. While most varieties of climbers can be pruned back to manageable heights, imagine how impressive your landscaping would look to have one of these tall beauties producing dozens and dozens of stunning blooms to fill your garden! For the most part these roses require much the same growing conditions as their vertically challenged cousins, but they also have some of their own unique requirements. One of the first considerations you have to think about is where you are going to grow them. Because of their sheer size, you should really choose a location where they will have ample space to spread out and grow. As I mentioned before, you can certainly prune your roses to a smaller size, but that would sort of defeat the purpose of having a tall rose in the first place. Many of the climbing varieties are also available as a bush rose, so if the height of your roses is a concern, you might be better off going with a bush style rose. 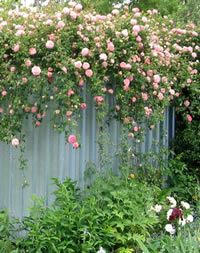 Roses also like to spread out from side to side as well, and the climbing varieties are no different. In my experiences, when you are dealing with a climber, it is usually better if you give it a lot of space to spread out. Try not to plant anything else within 2 to 3 feet of your roses or else you are likely to find that it will try to grow over and cling to it for support. This brings us to the next issue you will have to consider…training your roses! Unfortunately with climbers that can grow upwards of 20 feet tall, you will have to learn to train the canes one way or the other or else the plant will grow together and cross a lot of branches and it will just become really unruly and it won't perform as well as it could. The goal here after is to have a rose bush that produces as many blooms as possible. No one ever planted a rose bush and hoped it wouldn't bloom profusely! 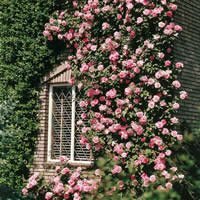 There are really quite a few ways you can train your climbing roses and most of the time it depends on the type of support you have for the plant. If you are growing your roses against a wall or a fence, then obviously you are only working in two dimensions, vertically and horizontally, so that makes it a little easier to fan out the branches. If you are growing your roses up and around say a pergola or gazebo, then you have to get a little more creative and work in 3 dimensions, making sure you train branches to grow in all directions. The simple explanation is you want to have room for the branches to grow as much as possible, but without crossing over other branches if it can be avoided. If your branches cross, the leaves from one branch are likely to shade the leaves from another, resulting in less energy generated for the plant. Try to think up a shape before the rose gets too big, and work on training it in small increments. Because these roses get so big they tend to get pretty heavy and rarely can they support their own weight. Everyone knows roses have thorns and for climbers, these thorns provide a much greater function that just protecting the stems. Ever notice how the thorns always curve backwards on the branch? This is no accident! As the branches reach out in all directions, they will inevitably make contact with other plants or structures, the backwards curved thorns are useful for securing the branch to these structures as the plant gets longer and heavier. You will need to make sure you are prepared to give your climbers ample support as they get bigger and bigger. 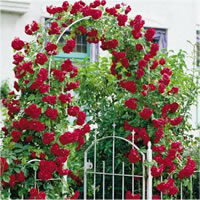 Trellises are common supports for roses, but they are not the only avenue you have. If you are growing around a fence or gazebo, you can get plant ties to wrap around the branches and secure them to the support. They make special ties that are guaranteed to support the weight of the plant without damaging it in the process. Any rose grower knows that pruning is essential maintenance when it comes to a productive rose. While the same can be said for climbers as well, many growers will dispute its necessity. On most rose bushes you pretty much prune the plant down to 2 to 4 healthy canes at the start of every growing season and force it to regrow each new season. This is not the accepted method for pruning the climbing varieties because they take several years to reach full size and if you pruned them back to only a few feet high each year, well you get the idea. The rest of the pruning tips pretty much apply however. Your goal for pruning is to open the plant up as much as possible and prevent any crossing of branches, unless intentional for shaping purposes. A good way to get started is to remove as much foliage as possible so you can see the structure of the branches. Remove any dead or diseased branches, then prune anything else you need to in order to achieve the desired shape. Once you get the hang of it, it's really not that difficult and you can prune an entire plant in just a few minutes each year.